New Delhi: The Union cabinet on Wednesday spelt out plans for a complete overhaul of the aviation sector with an eye on the future. The cornerstones of the new civil aviation policy are competition, consumers, connectivity (within India and with the rest of the world) and investment—both from domestic and foreign investors. The government is convinced that this will be the key to realizing its target of growing domestic passenger traffic nearly four-fold to 300 million by 2022. “We need more airlines, more aircraft serving our skies, so if more airlines want to come to India they are welcome," aviation minister Ashok Gajapathi Raju told reporters. It is a journey similar to the one pursued previously in telecom in which distinctions between technology platforms and licence types were progressively removed and investment rules liberalized. Accordingly, the Union cabinet partly scrapped the so-called 5/20 rule, which restricted overseas operations to only those airlines that had five years of domestic flying experience and a fleet of at least 20 aircraft. The five-year criterion has now been scrapped. “The questionable legacy of 5/20 rule has been thrown into the dustbin today," telecom minister Ravi Shankar Prasad said, announcing the cabinet decision. Ever since the government proposed to scrap the rule last year, the aviation ministry has seen lobbying by older airlines such as IndiGo (InterGlobe Aviation Ltd), Jet Airways (India) Ltd, SpiceJet Ltd and Go Airlines India Ltd and new entrants such as Vistara and AirAsia, in both of which the Tata group has a majority stake. The latter wanted the 5/20 rule scrapped while older airlines wanted it to stay. Despite that, the decision was welcomed with caution by Vistara and AirAsia. “We would have preferred, of course, that the 5/20 rule be completely abolished to ensure that Indian aviation achieves its full potential," said Phee Teik Yeoh, CEO of Vistara. Vistara, a joint venture between Tata group and Singapore Airlines Ltd, which is one year and five months old and has 11 aircraft, needs another nine planes to fly abroad. And because the government doesn’t want the airlines to focus on international operations at the cost of domestic ones, it wants airlines allowed to fly overseas to ensure that domestic flights account for at least 20% of their total seats. AirAsia India’s new CEO Amar Abrol said it will now focus “aggressively" on increasing the fleet size from six at present and achieving the target of 20 aircraft. He did not specify any timelines. “Though a 0/0 or 0/10 would have been more than welcome, the amendments that have been made to the policy are encouraging," he said. All airlines are currently also asked to place a certain percentage of their metro flights on routes which are remote and, in some cases, not as profitable. The aviation ministry has, under the new norms, made this even more strict and this would mean airlines will have to rejig their networks by the winter of 2017. “This is going to be very challenging and will create problems for how we have planned out routes and network," said a senior airline official who did not wish to be named. The ministry also announced a complex regional connectivity policy that seeks to connect unconnected towns with the help of viability gap funding. This will be done by capping fares at about ₹ 2,500 for those routes and helping airlines with some funding to ply them. The funds will be generated by charging a cess on other domestic flights. “Welcome to the world of affordable, convenient and cheap flying. 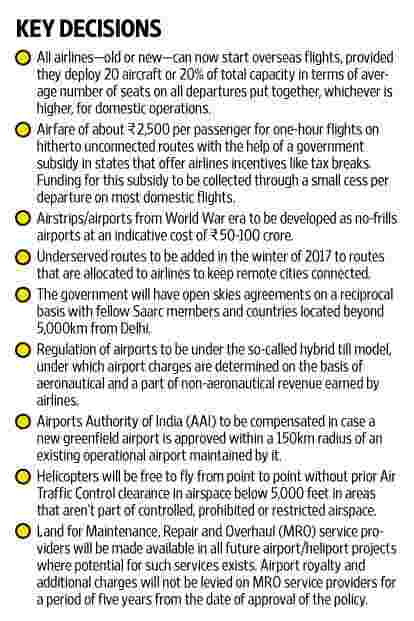 Please spread the word," said civil aviation secretary Rajiv Nayan Choubey, explaining the contours of the policy. Some airstrips/airports that are being used for cattle grazing and date back to the World War era will be developed as no-frills airports at an indicative cost of ₹ 50-100 crore and could host such flights, he said. The draft guidelines on regional connectivity will be placed on the ministry’s website in the next 10 days, said Choubey, who has been pushing for an integrated aviation policy since last year. The policy will also allow a open skies agreement on a reciprocal basis with India’s fellow-members in the South Asian Association for Regional Cooperation (Saarc) and countries located beyond 5,000km from Delhi. An open skies agreement means airlines from two countries can operate an unlimited number of flights to each other. The 5,000km area excludes countries in West Asia which have become hubs taking traffic from India via their airports to the US and Europe, among other regions. Government auditor Comptroller and Auditor General of India had come down hard on the aviation ministry for losses accruing to state-run Air India because of flying rights to carriers in the United Arab Emirates. In its new policy, the ministry also allowed airlines to handle ground operations themselves. Airlines went to courts against earlier orders by the ministry that required them to outsource their ground handling. Ground handling is critical to maintaining operational sanctity, especially for low-cost airlines such as IndiGo and SpiceJet that bank on faster aircraft turnaround time on ground to bolster profits. The policy has also made it clear that it will implement a so-called hybrid till of economic regulation for future airports. Under the hybrid model, airport charges are based on an airline’s aeronautical revenue and part of its non-aeronautical revenue. Will new aviation policy be the wind beneath airlines’ wings? Independent airports regulator Airports Economic Regulatory Authority will now have to follow this. The ministry has also given some sops to the ₹ 600-crore annual maintenance, repair and overhaul (MRO) business, 90% of which is outsourced to other countries due to high taxation. MROs will not have to pay airport royalty and additional charges going forward. Land would be earmarked for MROs in all future airport/heliport projects where potential for such services exists. To help some 8,000 unemployed pilots holding commercial pilots licenses, the aviation ministry will develop a scheme with budgetary support for type-rating (training on specific type of aircraft) on planes like Airbus A320s and Boeing 737s. Such training can cost anywhere around ₹ 15 lakh per pilot. For investors, the policy is a welcome sign as it clears the future roadmap India wants to take, said Dinesh Keskar, senior vice-president (sales), Asia Pacific and India, at Boeing. “This policy stabilizes the uncertainty that was prevailing in India. Now the future investor, airline operators have a reasonably good understanding of the future path of aviation in India," Keskar said, “This policy is progressive—certainly for regional connectivity." Shakti Lumba, former head of operations for IndiGo, said the policy may be difficult to implement. “A policy has to be coherent, it has to be fair and equitable and implementable. I see major implementation issues in the policy because of so many ifs and buts involved. It looks more like a wishlist."